Before the advent of the skyscraper -- and professional sports -- cities didn't have much of a visible identity. That all changed when somebody figured out how to put land in the sky, towns sprouted upward, and symbolic profiles of each metropolis were born. And soon after that, Americans started arguing about which one was best. Because that's what Americans do. And since we like a good argument as much as the next guy, we examined pictures of a ridiculous number of US skylines (we even looked at Hartford!) and then ranked the top 20 based on aesthetics, recognizable buildings, and the natural beauty that surrounds them. 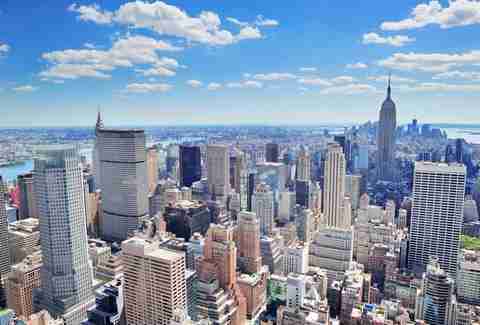 Quick quiz: Which US city has the fourth-most buildings over 300ft? Tulsa! 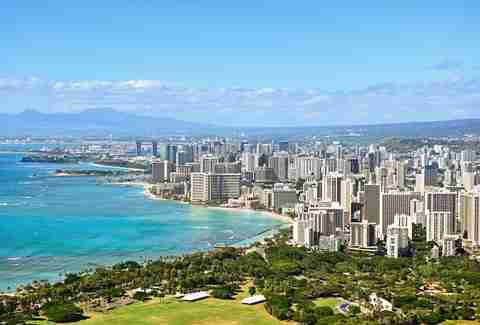 Just kidding, it’s Honolulu, where the hotels, vacation condos, office buildings, and apartments that line Waikiki make for one of the most impressive skylines in America. Architecturally speaking, they’re a bunch of white blocks and don’t offer much in the way of shape or form. But with the blue ocean in front and the green mountains behind, the setting alone lands it squarely on this list. 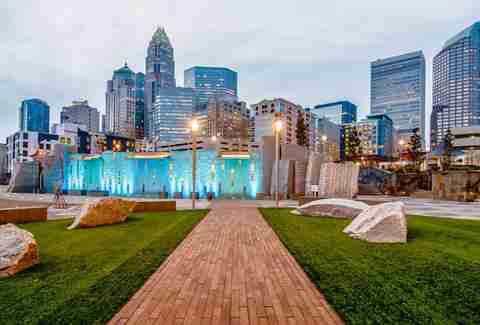 Charlotte's skyline knows that quality -- not quantity -- is what counts. First, the Duke Energy Center gives this skyline a different look every night, lighting up black and blue for Panthers games, green and red for the holidays, and whatever other color happens to be relevant during that particular day. But since Charlotte is a banking town, it’s no surprise the skyline is dominated by the Bank of America building, which looks a little like a glass-and-steel version of a Firecracker Jr. popsicle. Boston’s famous skyline is especially beautiful when viewed from the Charles River, with the modern-sleek Hancock Place nicely offsetting the Prudential Center and the golden dome of the Statehouse atop Beacon Hill. 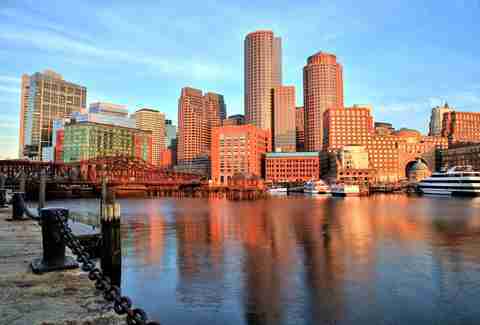 Throw in the Zakim Bridge and Custom House Tower (from other angles) and you'll definitely be nodding in approval. Thing is, though, the city is actually a lot smaller than its projection on the media landscape would suggest, so it falls down to number 18. Fifteen years ago, Miami might have made a decent claim for the top spot. But a decade of uncontrolled construction has left this once-beautiful skyline looking like a waterside conglomeration of generic white towers -- and almost indistinguishable from Panama City save for the multi-colored Miami Tower and the stripper dancing on the InterContinental Hotel. And it will only get worse once they build this thing that looks like a dong. You probably first became familiar with this skyline as the backdrop for the rooftop rendezvous in Fargo. 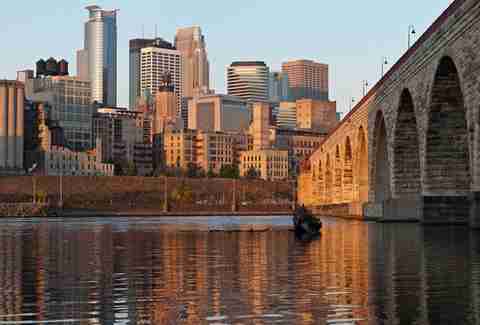 From the river, the skyline is preceded by the 19th-century Stone Arch Bridge, and the buildings themselves are highlighted by the 57-story IDS Center, the circle-topped Capella Tower, and the cascading Wells Fargo Center. But perhaps the coolest thing about this skyline is that most of the buildings are connected by the Minneapolis Skyway System, so people can move through downtown without having to walk in the brutal Minnesota cold. 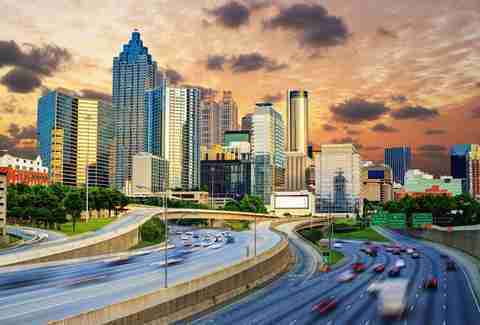 The best part of Atlanta’s skyline is that you’ll have plenty of time to enjoy it while sitting in your car, since traffic backs up in and around the city pretty much 24/7. And lovely as the triangular-topped trio of Bank of America Plaza, SunTrust Plaza, and One Atlantic Center are, not to mention the cylindrical Westin Peachtree Plaza and alluring sign for The Varsity, an hour is more time than anyone needs to spend looking at them. OK, so it’s not a traditional skyline in the sense of towering skyscrapers and twinkling lights. 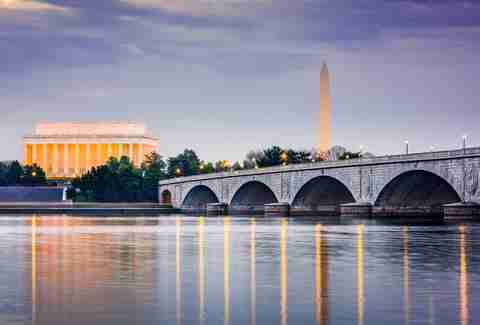 But if you’ve ever driven past the Potomac at night and seen the Lincoln Memorial and Washington Monument lit up, it’s hard to argue that you need tall buildings to have an impressive skyline. 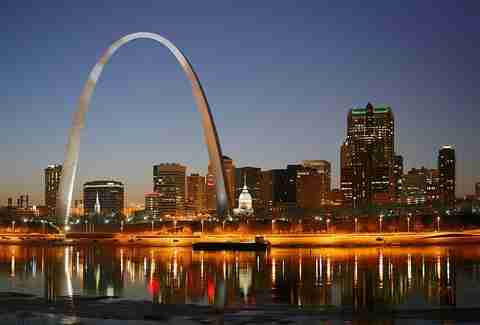 If there is a one-man team of American skylines, it’s St. Louis. Here, the entire skyline is unrecognizable save for the giant 630ft Gateway Arch, America’s tallest monument and pretty much the only thing people know about the city that doesn’t involve baseball or beer. Urban Hiking Is a Thing. Here's Where to Do It. 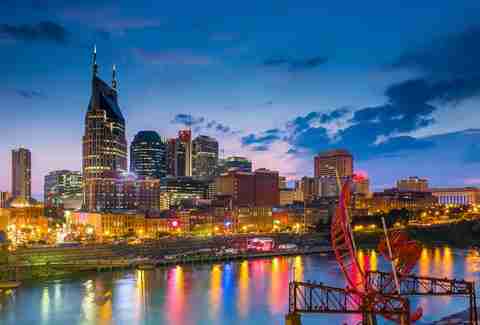 Though its most iconic building looks like a superfan’s rendition of Wayne Industries World Headquarters, Music City’s skyline is almost as impressive as the neon lights on Broadway. Nashville hasn’t gone super-tall with its office towers (the AT&T Building is only 33 floors), but the buildings it does have sit nicely along the Cumberland River and make it an impressive downtown without going overboard. Much like the city itself, the skyline is understated but recognizable. Even if Bob Dylan did write a whole album about it. 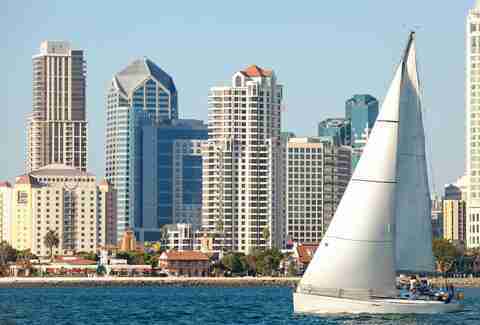 If you’re a fan of San Diego’s skyline, you can get terrifyingly up-close-and-personal with it any time you fly in as jets commonly fly through downtown on their landing approach (somehow, this is OK with the FAA). The lights of the skyscrapers reflect perfectly off San Diego Bay and serve as a daily reminder of civilization for recruits at the Marine Corps Recruit Depot a few miles away. Though the quality of its namesake chili might be a subject of hot debate (chili on spaghetti? REALLY? 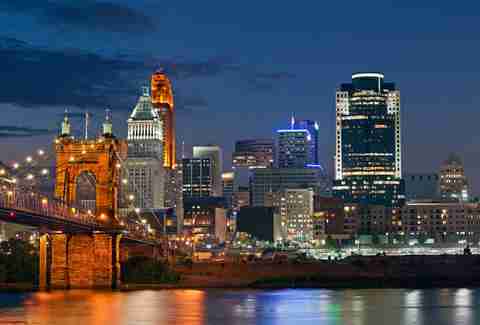 ), you can’t debate the aesthetic beauty of the Cincinnati skyline. Start with the John A. Roebling Suspension Bridge, after which New York’s Brooklyn Bridge is modeled. Then, across the Ohio River, you’ll see a skyline book-ended by two brand new stadiums with a collection of architecturally distinct glass towers in between that reflect the water and the sunshine. Kind of like its bagels and basketball team, New York's skyline is highly overrated. Is it the most recognizable in America? Sure. But after a century of vertical growth, New York’s skyline has basically become the Empire State and Chrysler buildings, and One World Trade Center, surrounded by miles of dense, generic black-and-brown boxes. It only ranks this high because of its beautiful landmarks. 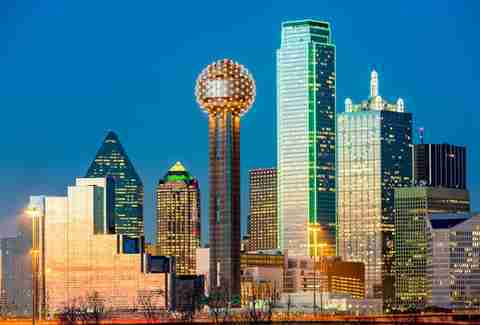 It’s hard to look at the big ball on top of Reunion Tower and not harken back to your favorite episode of Cheaters. But even if there ISN’T someone messing around on his wife at the top of the state’s second tallest observation tower, its lights -- combined with the green neon of the Bank of America building -- make this the prettiest skyline in Texas. Tuesday. At 9am. Is as good a time as any to gaze at the best skyline on the East Coast, where America’s fifth-largest metro area shows its size with the towering 119 total floors of One and Two Liberty Place (the former stands at 945ft). 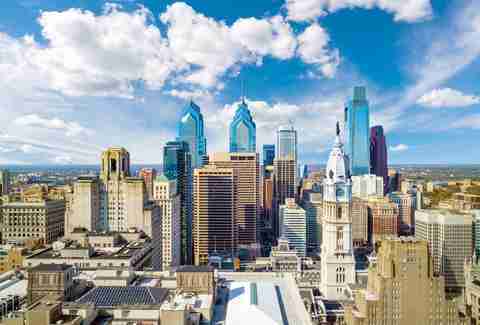 Philadelphia City Hall, though only the ninth-tallest building in town, was the tallest in the world from 1901-1908. You already know about the three rivers that converge right at downtown Pittsburgh, because watching football CAN be educational. 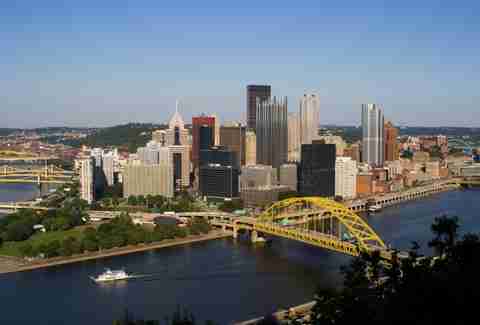 But Point State Park only serves as the front for the best small-city skyline in America, where the Ft. Duquesne and Ft. Pitt bridges flank an impressive cluster of tall buildings, most notably the crown-topped One PPG Place and the spire-topped Fifth Avenue Place. If you can catch it on a day when there’s no smog (like that one time mama cooked breakfast with no hog and the Lakers beat the Supersonics), you'll know why they named it the City of Angels. 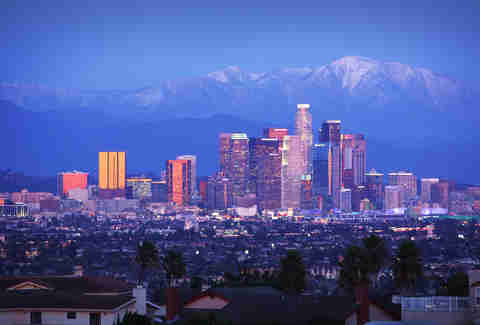 The mighty LA skyline still stands tall against the San Gabriel Mountains, with the US Bank Tower heads up an impressive tapering of 50+ story buildings. Even with the plumes of fog cover, it’s hard to find a more spectacular manmade sight in the US than the Golden Gate bridge sprawling out from north of the Transamerica Pyramid. And unlike New York and Miami, SF hasn’t built up out of control. 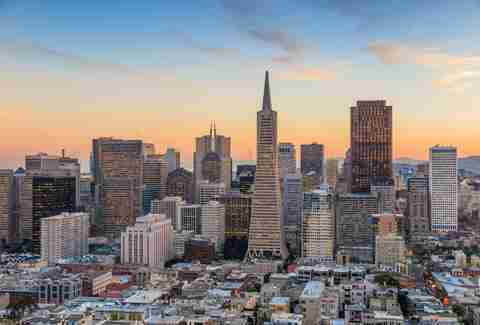 Which makes for some nasty rents, but this article is about skylines, not your bottom lines. When you can combine a pyramid, the Eiffel Tower, the Empire State Building, a golden lion, and the ruins of ancient Rome, and cover it all in neon, you’re clearly doing something right. 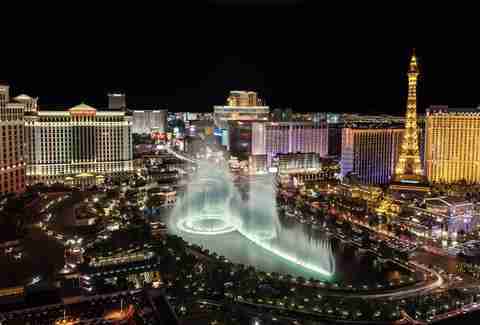 Although much like the people who go there, what the Vegas skyline lacks in depth it more than makes up for in aesthetics. Chicago, like it did with cold weather and street crime, has taken something New York does well and improved on it. Because while Chi-town built up just like NYC, it managed to avoid going crazy with it and maintains a skyline with shape and recognizable features. 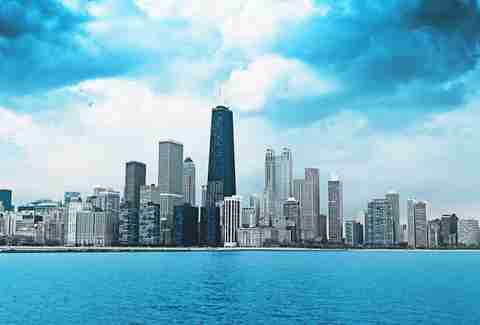 Set that on the shores of Lake Michigan, and you’ve got one of the best big city skylines in the WORLD. 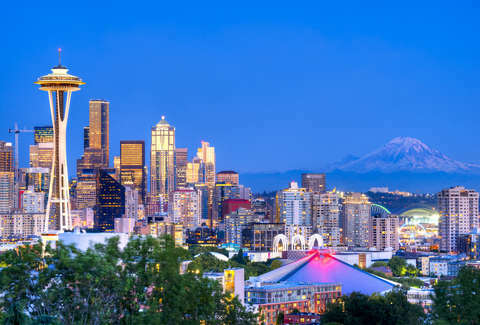 Set a bunch of architecturally distinct high-rises on a steep hill, front it with a space-age national landmark, put snow-capped Mount Rainier in the background, and set it all on the shores of Puget Sound, and you have the most breathtaking skyline in America. And not just on Seattle's six sunny days a year. 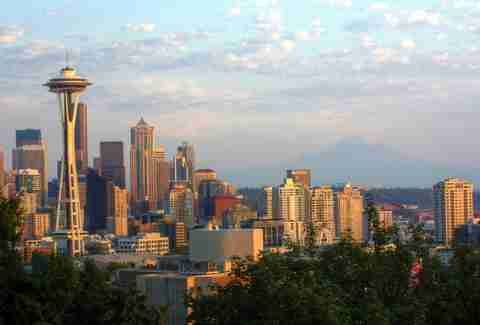 Matt Meltzer is a staff writer who is well aware Seattle has more than six sunny days a year. There's photographic proof on his Instagram @meltrez1.